Twenty years ago and far away in the city of Corona, Amy and Tommy Powers’ kids found a snake in their family’s garage. The creature turned out to be an harmless California Kingsnake of not-so-considerable size. They planned to keep it only a couple of days. Two decades later, the now 6- feet-long Thunderbolt resides, along with the Powers and the family’s dwarf bunny rabbit, Eddie, reside on a cul-de-sac, behind the gates of Portuguese Bend, in a true, Tuscan style farmhouse architect Edward Carson Beall, himself a natural history buff, and collector of fossils, and old bones. 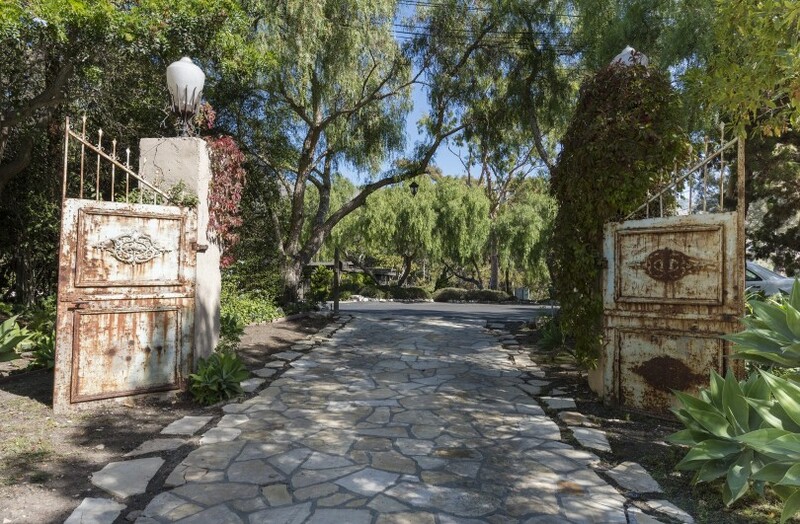 The tree lined Palos Verdes stone driveway leads to an antique, wrought iron gateway. Tommy Powers was a “stay-at-home-dad” before the practice was commonplace. This majestic pine tree creates a canopy over the rear of the house. Tommy is a graduate of Ohio State’s film school and subsequently worked as a screenwriter and musician. Amy owns La La Land Creative Co. in downtown Los Angeles, which designs and manufacturers women’s clothing. A vintage Singer sewing machine with built-in cabinet is displayed in their daughter Mazzy’s bedroom –a nod to the family business. A long winding, cobblestone driveway peppered with canopy trees and swinging lanterns leads to a welcoming set of white antique gates. The backyard loggia is steeped in natural stone, by a babbling fountain, in front of an arched, multi-paned European styled picture window. “When Susie and I purchased the house in 2002, the grounds had not been taken care of for years. We terraced it and brought in mature trees and built around the majestic ancient trees that already graced the property,” Beall said. 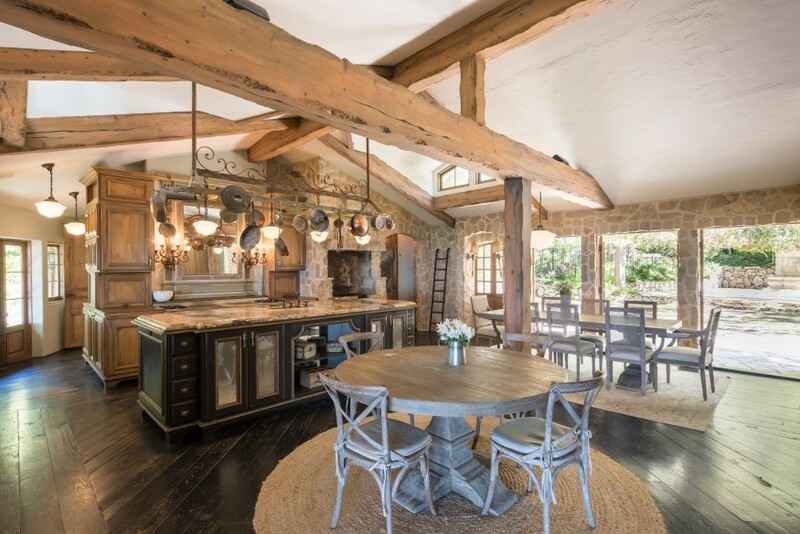 The professional kitchen gets its Old World feel from a La Cornue stove and the steel beams clad in distressed wood. General contractor Octavio Valdivia spent a year and a half remodeling the home. “My wife Susie and I decided to gut the house completely, leaving only the walls and roof, and we continued to live there, moving from one side of the 3,500 square foot house to the other side during the construction. We also added about 500 square feet to make room for an additional master bathroom and guest bedroom. The key to a successful marriage is to have separate bathrooms. This house has that,” he noted. 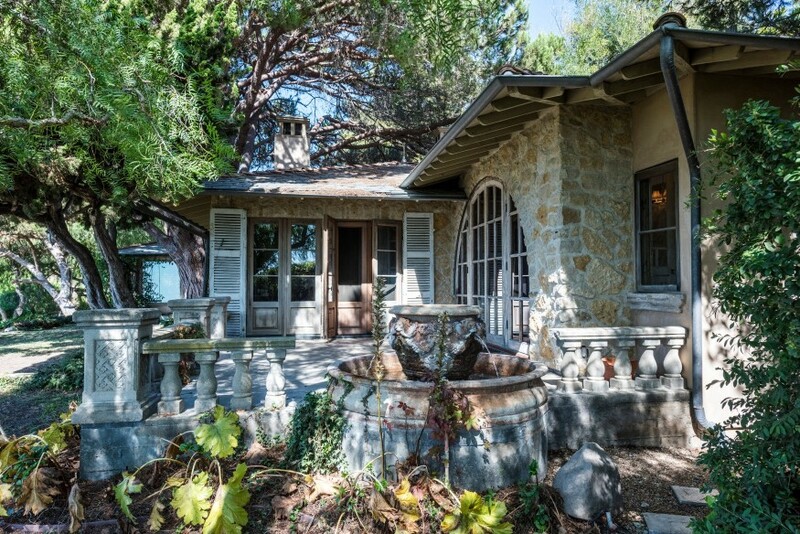 There are several points of entry for this home as one follows the path that passes by the pool house, the garage that was converted to a family room and three sets of French doors that lead to the formal dining room. Further west are formal, 12 foot high, arched, antique entry doors. A long, single pane of glass in the living room offers a panorama of the Pacific ocean, and a wrought iron altar outside and the many trees. The guest bedroom has a rectangular skylight with perimeter windows that impart indirect sunlight into this cozy enclave. Beall ordered the interior doors from Europe. When they arrived, they varied in height from six- to eight-feet. The home has hosted many weddings. The kitchen is professionally equipped with a commercial Hobart dishwasher and an oversized La Cornue stove. The adjacent scullery or butler’s pantry contains an antique, white porcelain farmer’s overlay sink. Above the kitchen and dining rooms, and traversing across the ceilings are massive, Old World steel beams with wood cladding. “I had a great woodsman who bonded the wood to the steel beams and then beat the daylights out of them,” Beall said. Track lighting, concealed in channels on top of the beams create the appearance of natural lighting. An etched. 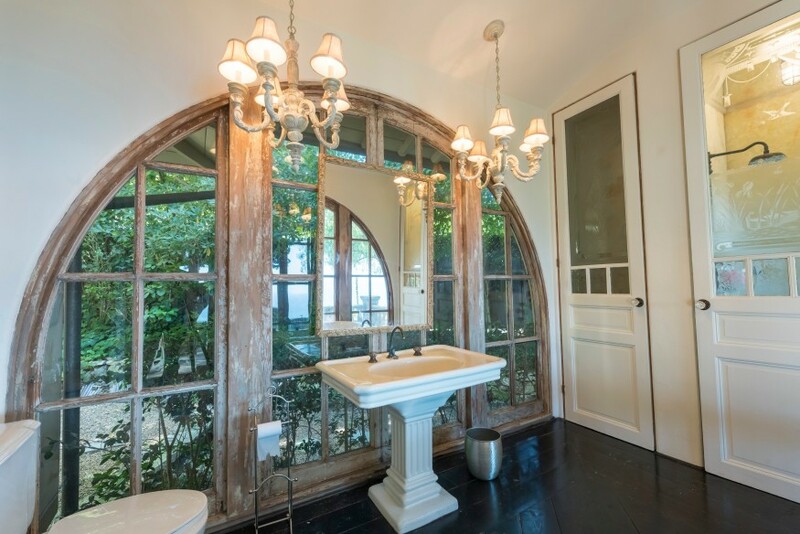 glass shower enclosure and black painted pine floors add to the Old World elegance. The hardwood floors are pine painted black and then distressed. There are five fireplaces inside and five fountains outside. There’s a spacious, underground cellar. The fireplace features a metal medallion with an embossed or repoussage figure riding driving a chariot. Beall said his biggest regret in selling the house is having left behind the medallion of the chariot and and the medallions over the living room fireplace and over the antique bathtub in the master bathroom. 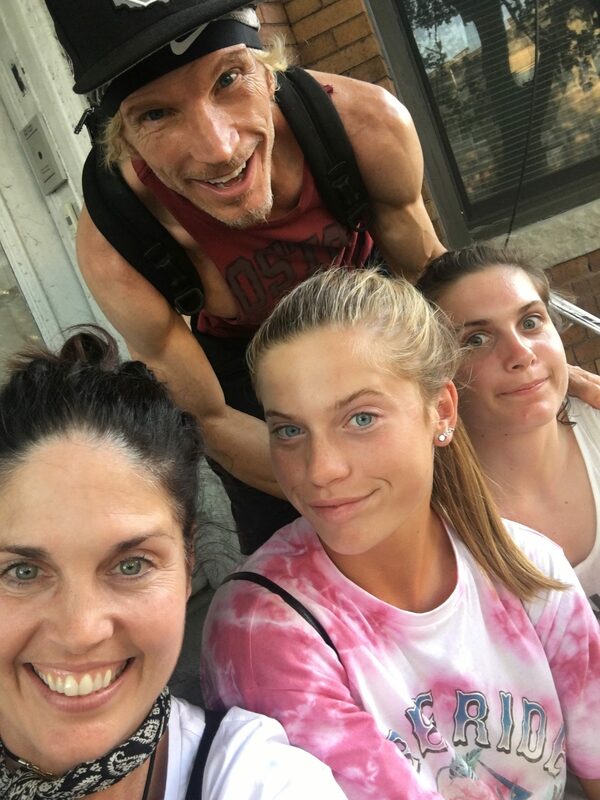 Amy, Tommy, Mazzy and McKennah Powers. On April 21, 1987, Tommy’s sister drove him to an interview at a modeling agency in Columbus, Ohio. While waiting for his interview, he met Amy. After the appointment, he told his sister he had met the girl he was going to marry. She was the agency’s administrative and herself a model, named Amy. Then Tommy and his sister drove off to their grandmother’s 50th wedding anniversary in Pennsylvania. Amy and Tommy married on Independence Day, 1996 in North Myrtle Beach, South Carolina.